Junebug is merry and bright! Junebug is much more colorful with her Christmas decor and new seat cushions. Why does work have to get in the way of my hobbies? I had a rather long and boring day at work today. I tried my best to be productive, but any time I return from a week off, I struggle to get back into the swing of things. On a positive note, only one more day of work and then it’s off again for the rest of the week! I’m going to get back to work on Junebug on Wednesday, otherwise known as the first day of 2014, to get the new year started off right! I’m trying to decide what project(s) to tackle on my days off. I really wanted to start big and take off her skin to reveal what kind of surprises she has in store for me on the inside framing. I’m hoping there aren’t any bad surprises, but you can never tell with a camper that is 53 years old! I know there is a leak and water damage to the interior paneling, so I’m really hoping there isn’t any dry rot going on under there. Here’s the kitchenette area. 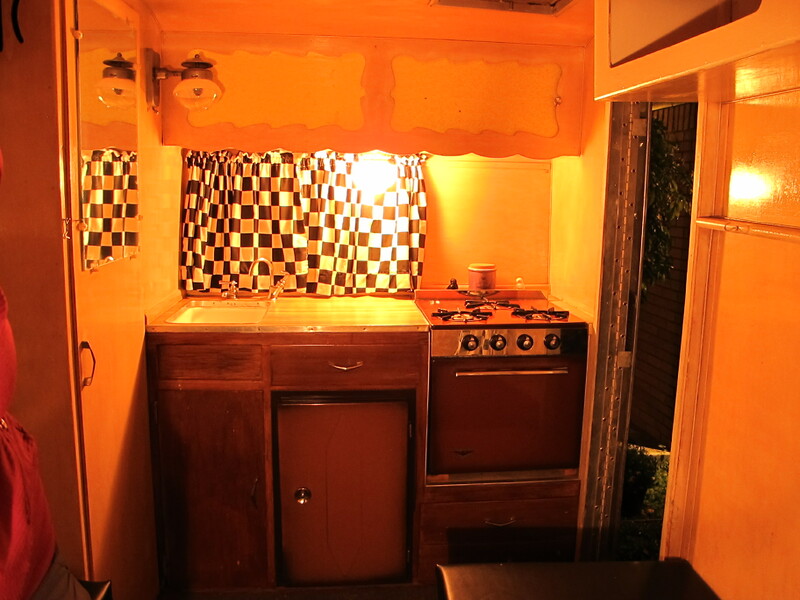 It has the original propane stove and oven as well as the ice box. You’ll also see the original gas lamp in the upper left corner. I don’t think I’ll use that since it probably gets pretty warm. 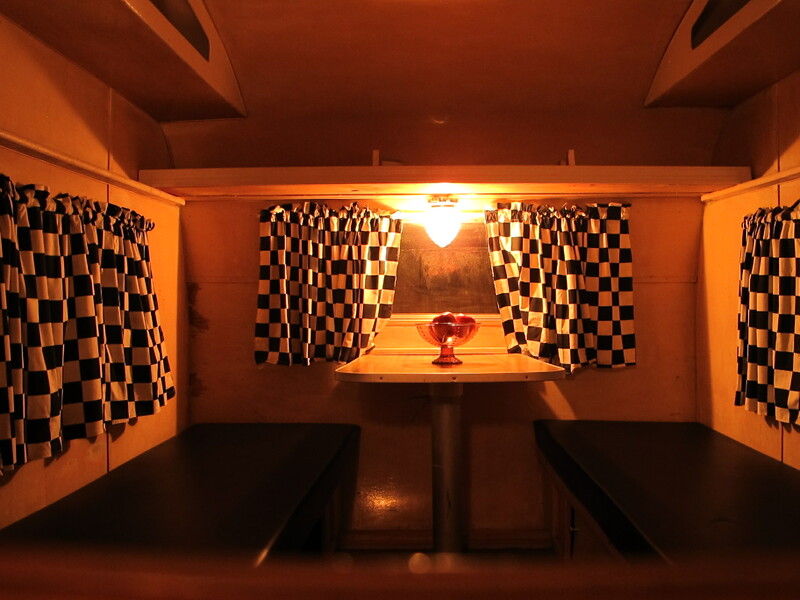 Here’s the dinette. The seats are covered in black vinyl and all the curtains are black and white check. Not completely hideous, but not my style. 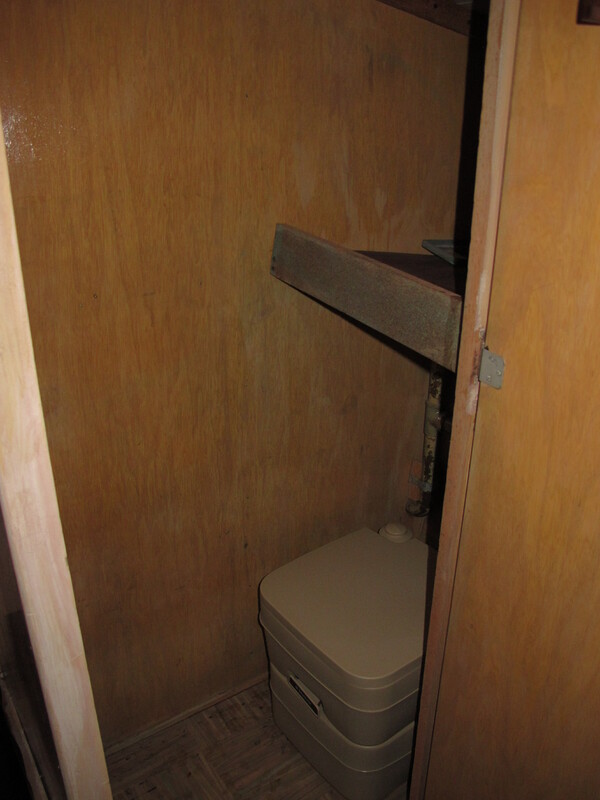 Here’s the closet, which I have turned into a bathroom. I hate the thought of using a porta potty, but in the middle of the night, I do not want to venture outside to find the public restroom or go in the woods, so I’m willing to make a compromise. 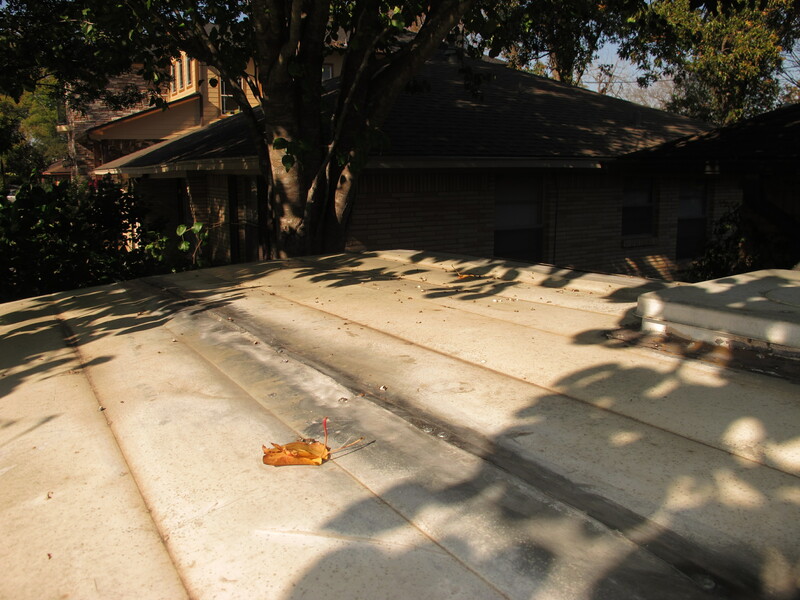 The roof is in pretty poor condition at the moment. Needs to be resealed and screwed back down to the frame. I’m hoping it’s not that way because the frame is rotted. I’ll find out soon! This is the worst seam, it’s completely open and you can see the insulation when I press on the aluminum. Definitely needs a repair pronto! Right now, duct tape is my friend. 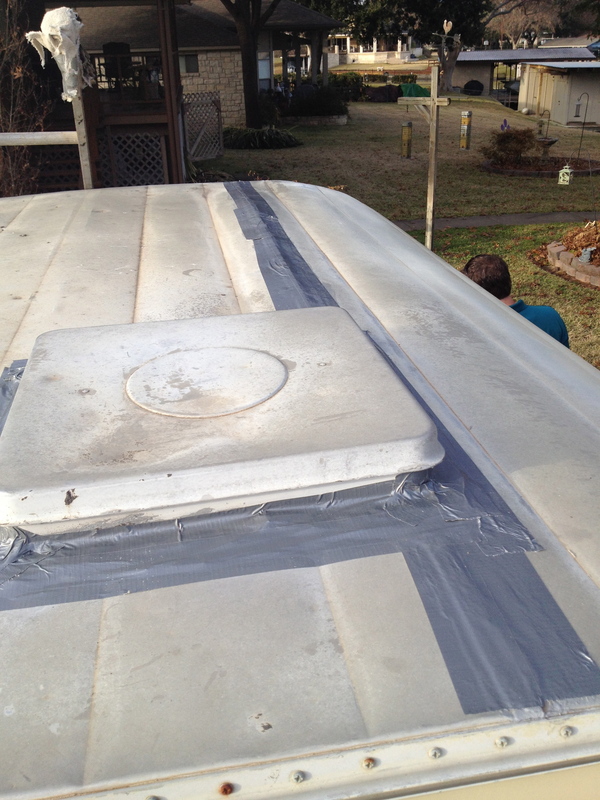 I know, I know, I shouldn’t patch up my camper with duct tape, but it’s only a temporary solution until I have the time to do it the right way! Posted in 1961 Shasta Restoration Project and tagged 1961, canned ham trailers, exterior vintage camper photos, glampers, glamping, Hobby, interior vintage camper photos, Junebug, projects, renovation projects, restoration, Sisters on the fly, Tin Can Tourist, travel trailers, vintage camper restoration, vintage campers, vintage Shasta. Bookmark the permalink. So I’ve taken on a renovation project, and Junebug is her name. 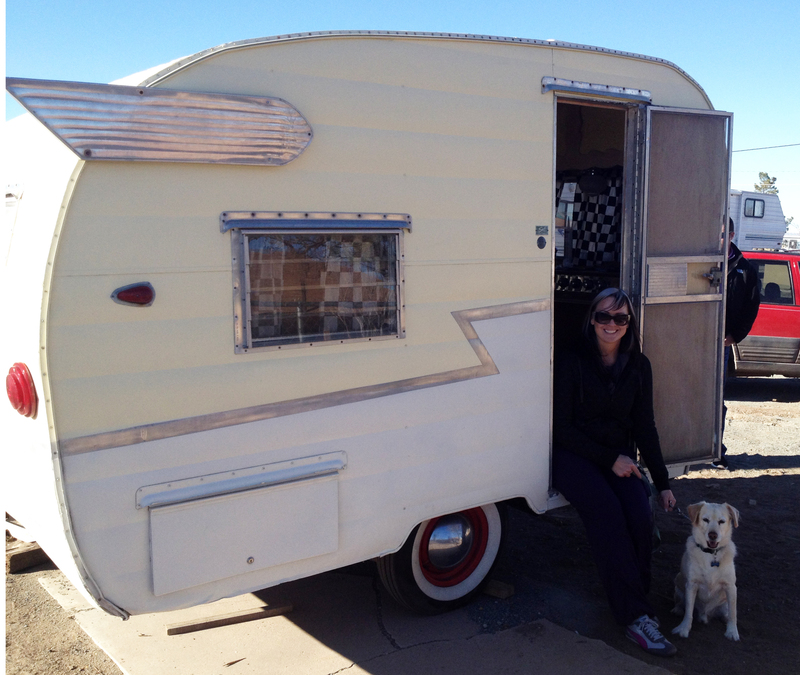 She is a 1961 Shasta Compact camper and I love her already, even with all of her imperfections! I should have started chronicling this adventure back in early December when I first got Junebug, but I wasn’t sure if I had the energy to write everything down. Today I decided it would be worth it, so I’m giving it a go. 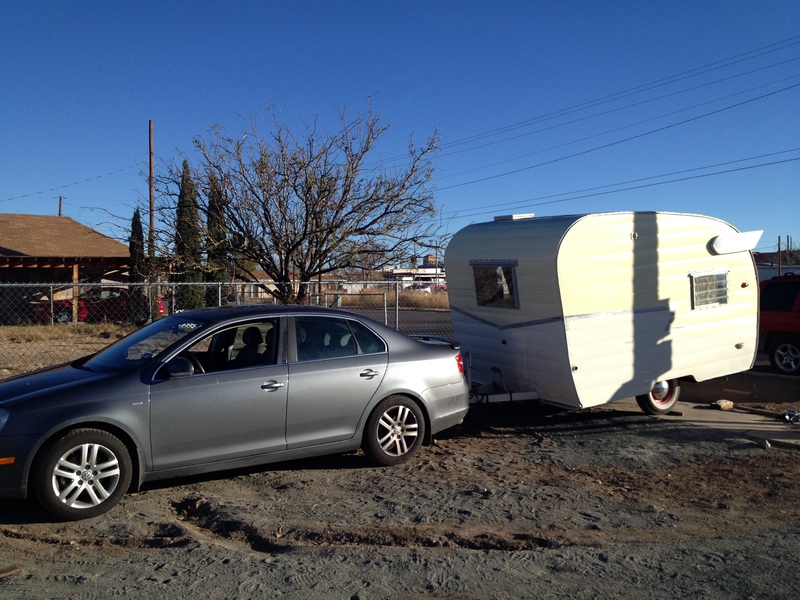 I bought Junebug in Lordsburg, New Mexico on December 7th. I drove 14 hours to get her and managed to get exposed to bed bugs in a shady motel along the way. Perhaps that’s why I decided to name her JuneBUG, however I would rather forget that whole incident so as not to sour the experience completely. The son of my mother’s good friend from college volunteered to accompany me on my journey. I took him up on the offer, thinking it would be safer, especially since I was carrying a lot of cash and driving a long way by myself (Baxter was there too, but he doesn’t count since I’m pretty sure he would only be able to love someone to death). After arriving back home with my new camper, I noticed she was leaning quite a bit to one side. Upon closer inspection (and advice from my friendly neighbors), I realized she had two different springs installed. I took her to the nearest trailer shop to be inspected and repaired. Luckily leaf springs were only about $30 each, so she got two new leaf springs as well as rewired tail lights. Apparently the previous owner had installed the wrong sized leaf spring on one side and wired the tail lights backwards. I’m not sure what he/she was thinking, but I’m glad someone here was able to set her straight. Next I set about trying to find the leak in the roof. I knew that vintage canned ham trailers such as Junebug were prone to leaks, and she was no exception. 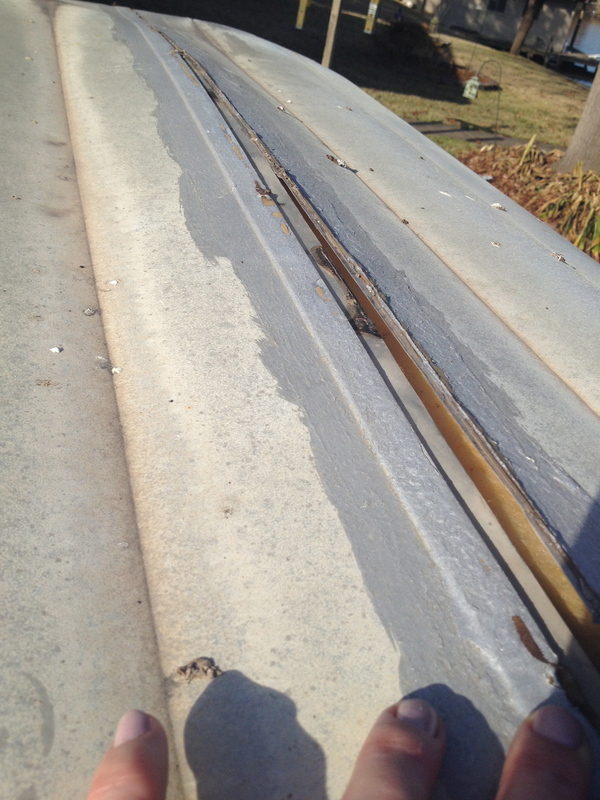 I could see the water damage to the interior wood and needed to find the source(s). In the meantime, I ordered a waterproof cover for her so that I could protect her from the frequent Houston downpours. I only had two weeks until Christmas, and I planned to take Junebug to my grandma’s house near Austin, so I had to get moving to get her ready! The house was going to be full, and I wanted this to be Junebug’s first official excursion as well as my first experience not having to fight over the right to have my own bedroom at my grandma’s over the holidays. It’s funny how if you are married, you automatically get rights to your own bedroom just because there are two of you, even if there are others who are older and single who (in my humble opinion) should get first dibs. Oh the injustice! It’s getting late, so I will continue catching everyone up to date on Junebug’s adventures tomorrow night when I have more time. A demain! Junebug dressed up for the Christmas card photo! This is the hotel we stayed in on our way back from Lordsburg. This is NOT the hotel with the bed bugs. I’m sure the bed bugs were in the Days Inn in Van Horn. 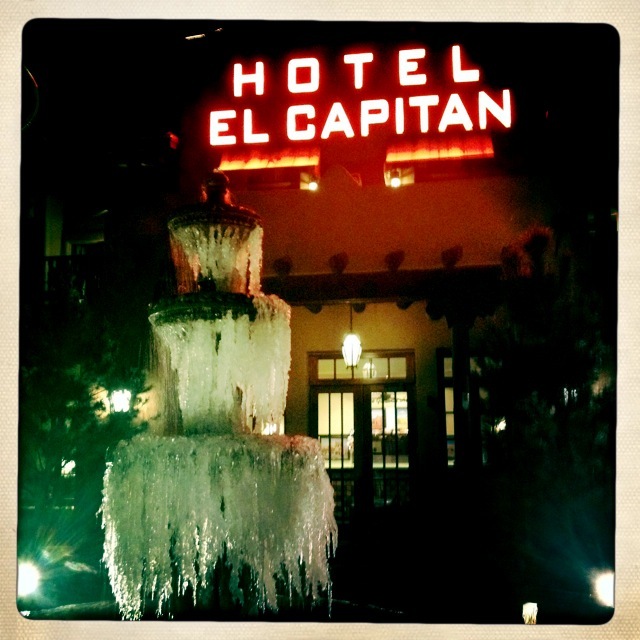 The El Capitan was very nice and we actually secured the last room in the whole town thanks to the ice storm passing over the area. This is a picture of Baxter and me right after we purchased Junebug. 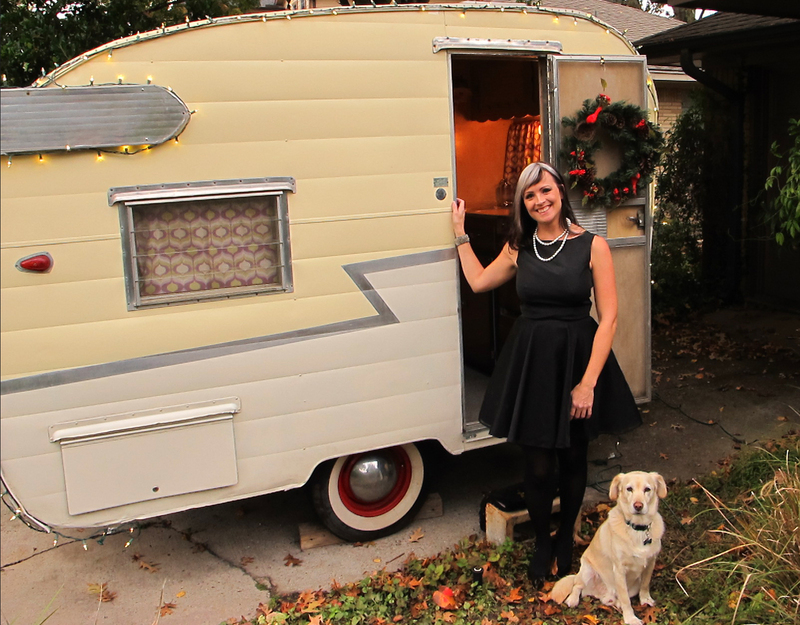 I am super excited that my dream of owning a vintage camper has finally come true! 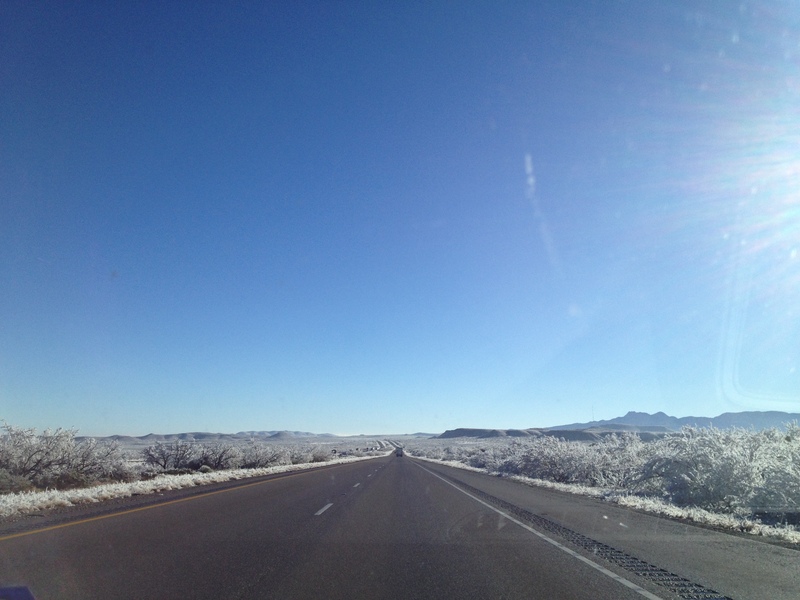 The morning after the ice storm, the roads were clear and we set out to return to Texas with Junebug. Posted in 1961 Shasta Restoration Project and tagged 1961, Bed bug, canned ham trailers, Days Inn, DIY, exterior vintage camper photos, Frolic Camper, glampers, glamping, Houston, interior vintage camper photos, Junebug, Leaf spring, Lordsburg New Mexico, New Mexico, pictures, projects, renovation projects, road trips, Shasta camper, Shasta Compact, Sisters on the fly, Texas, Tin Can Tourist, travel trailers, Vintage Camper Rally, vintage camper restoration, vintage campers, vintage Shasta. Bookmark the permalink.